Nine Grammys. Stands 6’7”. Leader of the band for 30 years. Numbers work in Ray Benson’s favor. 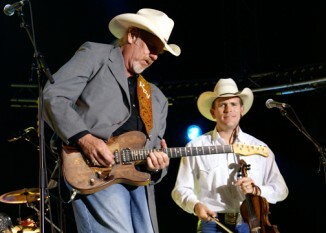 His legendary band, Asleep at the Wheel, helped to put Austin music on the map in the 1970s, when it was mostly centered around one spot: the Armadillo World Headquarters. In the decades since, he’s enjoyed working with many of the great musicians of our time: Willie, Dolly, Dylan, and the Chicks. Beyond Time, the post-modern King of Swing’s just-released first solo album, comes 45 years he wrote his first song. About the new album that contains almost entirely self-penned songs, he says, “we’re just dealin’ with 12 notes and a language of words and poetry.” As if a life full of music and adulation weren’t enough, Benson has been designated the 2004 Texas State Musician by the Texas House of Representatives. He is also very involved locally with the Rhythm & Blues Foundation and the St. David’s Foundation. We spoke with him during a recent recording session. Lance Avery Morgan: What is your nickname? 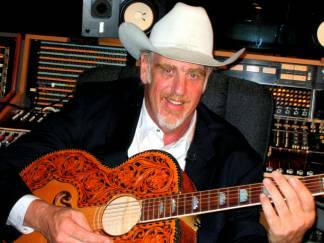 Ray Benson: Bismeaux (pronounced Bismo). LAM: What would be your superpower of choice? LAM: What is the worst thing to be without? LAM: What is your greatest joy? RB: Seeing my sons fulfilled. LAM: What is your most prized possession? RB: My musical ability—singing and playing the guitar. LAM: What are two CDs you’d need to have on a desert island? RB: Tony Bennett and Bill Evans. LAM: What is your favorite guitar? RB: The one in my hands at the moment. LAM: Who would your dream duet be with? RB: I have already done one with Willie. The other would be Tony Bennett. LAM: What was your best moment on stage? RB: Too many to count! LAM: What trademark does every song of yours have?